Saint Patrick of Ireland is one of the world's most popular saints. He is best known as the patron saint of Ireland, but also as the patron of Nigeria, engineers and excluded people. Patrick was not Irish. He was a Briton, born in the Roman province of Britannia to a wealthy Roman-Briton family. He was not the first Christian missionary in Ireland either. However, tradition tells that he converted almost the entire population of Ireland to Christianity during his lifetime. 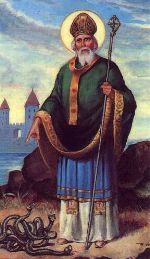 Patrick died on March 17, 461, after almost 30 years of intense evangelisation in Ireland, and soon became Ireland's Patron Saint. His burial place has been the most important pilgrimage site in Ireland for over a thousand years. Saint Patrick's day, March 17th, is Ireland's National Day, a global day of celebration of all things Irish. It is celebrated throughout the world, linking many millions of people of Irish descent, but nowhere in the world is it more special than in Ireland, where the country's greatest annual celebration takes over for a spectacular week long festival. What do we know about Saint Patrick? Compared to many other saints of his time, quite a lot is known about him, mainly because we conserve two very reliable sources: his autobiography "Confessio" and his much shorter "Epistola to Coroticus". Saint Patrick's real name was Maewyn Succat. Patricius was his baptismal name, given by Pope Celestine prior to Patrick's mission to Ireland. It is uncertain exactly when and where Maewyn Succat was born, but it is believed to have been between 385-390 A.D., in the village of Bannavem Taburniae, somewhere along the north-west coast of the Roman province of Britannia. The actual location of "Vico Bannavem Taburniae" has never been securely identified. Maewyn Succat was born to a wealthy Romano-Briton family. His father, Calpurnius, was a deacon whilst his mother, Concessa, was closely related to Saint Martin of Tours. In his "Confessio", Patrick describes his youth as "not very religious and not very studious". At the age of 16 Maewyn Succat was kidnapped by Irish pirates, separated from his family, taken to Ireland, and sold into slavery. He learnt the language and the customs of the people who held him, and for the next six years he worked as a shepherd for a local chieftain. According to his "Confessio", it was during this period that he developed a deep faith in God: "I prayed in the woods and on the mountain. I felt no hurt from the snow or ice or rain", he wrote. Maewyn Succat escaped from captivity at the age of 22, after having a dream from God in which he was told to leave Ireland by going to the coast. He traveled many miles to the sea and there he found a ship which took him back to Britannia, where he was reunited with his family. By this time Maewyn Succat had decided that he wanted to be a priest. The determined Briton went to Gaul to begin his studies for the priesthood under the guidance of Saint Germanus, Bishop of Auxerre, who ordained him in 417. Patrick spent about 15 years as a disciple of Germanus. During all this time, he felt a calling to return as a missionary to Ireland. 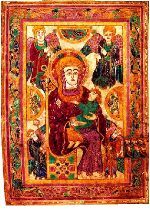 At last, in 432, Pope Celestine gave Maewyn Succat the baptismal name of "Patricius", consecrated him as Bishop, and sent him to take the Gospel to Ireland. Patricius arrived in Ireland in the winter of 433 and made his base at Armagh. Local chieftain Dichu, his first converted patron, gifted a large barn for a church sanctuary: "Saul" became the first church dedicated by Saint Patrick in Ireland. Over the next 30 years Patrick and his disciples traveled extensively throughout Ireland, preaching, converting, baptising, and building churches and monasteries all over the island. Patrick did not condemn the Celtic beliefs of the Irish but he assimilated their practices into a totally Christian spirituality -their sacred wells became Holy Wells dedicated to the saints, their druidic oak groves became Christian chapels for the Eucharist, etc. Patrick was also very successful in winning the local chieftains to the Faith which, in turn, made it easier for their subjects to embrace Christianity. Patrick died on March 17, 461, after almost 30 years of intense evangelisation in Ireland, where he consecrated some 350 Irish Bishops to follow his ways. It is believed that he was buried at Saul, where he had built his first church. It is commonly agreed that Patrick and his disciples converted almost the entire population of Ireland to Christianity during his lifetime. "You haven’t seen the real Ireland if you had not paid your respects to the Patron Saint", they say. Downpatrick, a small town in the heart of County Down, Northern Ireland, two hours north of Dublin, hidden well off the tourist trail. The place where Saint Patrick both began his mission and was finally buried. The most important pilgrimage site in Ireland for over a thousand years. Irish men and women emigrating to America in the 1800s would travel for miles to take a handful of the sod from Saint Patrick’s grave for good luck. The Book of Armagh tells us that when Patrick died his mortal remains were interred on the Hill in Downpatrick. A monastery and church were erected at that site and the medieval town grew up around Saint Patrick’s grave. The relics of Irish missionaries Saint Columba and Saint Brigid of Ireland also came to be buried with those of Saint Patrick. In March 2001 a site devoted to the story of Saint Patrick opened at the foot of Cathedral Hill where tradition places the burial of the Saint. The St. Patrick Centre, an award-winning $10M international cultural project, provides a focus and home for the study and celebration of the Patron Saint’s worldwide legacy. The Director of the Centre, Dr. Tim Campbell, points out that his aim is to make visitors to Ireland more aware of Saint Patrick’s Country and the importance of this area as the cradle of Irish Christianity. Currently the St. Patrick Centre caters for over 120,000 visitors each year. There are many legends and stories of Saint Patrick, the most famous of which is that he drove the snakes out of Ireland. This same legend is found in Galicia and it is very likely that the story was meant to be symbolic, since for geographic and climatic reasons Ireland never actually had snakes. In the Celtic tradition serpents were associated with fertility and wells, while in Christianity the serpent was Satan, the devil. Therefore, it is believed that the snakes referred to the serpent symbolism of the Pagan priests, the Druids, and to Saint Patrick converting the heathen and eliminating pagan beliefs. The popular green shamrock -the internationally known symbol of Ireland- and Saint Patrick are closely associated. Saint Patrick's day, March 17th, is Ireland's National Day. From Killarney to Downpatrick, from Cork City to County Donegal, Ireland is buzzing with special celebrations. The Irish people are famous for their parties. In Dublin, the capital city is quite simply high on party fever as Ireland's greatest annual celebration takes over for a spectacular week long festival - St. Patrick's Festival Ireland. An exciting programme of events includes street theatre, fireworks, music, exhibitions, open-air markets, fun fairs, etc. Visitors can enjoy the spectacular carnival of the St. Patrick's Day Festival Parade, join in the dance at the largest outdoor Céilí and choose from a selection of Irish music concerts. Streets are closed to traffic and the city centre becomes a playground as revellers enjoy the entertainment. Saint Patrick's Day is also a global day of celebration of all things Irish, a day when everyone is Irish. It is celebrated throughout the world and links many millions of people of Irish ancestry, especially in the United States, where there are about 39 million people of Irish descent. The largest Saint Patrick's Day Parade in the world takes place in New York City. The first official parade in the City was held in 1766 by Irishmen in a military unit recruited to serve in the American colonies. In 2003 more than 150,000 marchers (emigrant societies, social and cultural associations, police groups, pipe bands, etc.) participated in the New York City Saint Patrick's Day Parade. Do you want to know more about Saint Patrick? The St Patrick Centre tells the story of Ireland's patron saint in his own words. It is the first time that Saint Patrick's story has been comprehensively and credibly presented as a permanent exhibition anywhere in Ireland. This fine 19th Century Gothic Cathedral is built on the Hill of Down, one of the holiest Christian sites in Ireland. Its graveyard contains the traditional burial place of Saint Patrick, Brigid and Columba.